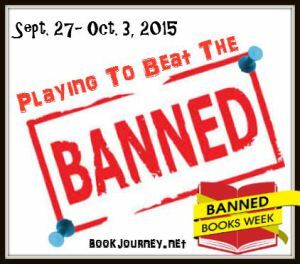 This is Banned Books Week. Thanks to Sheila at Book Journey for bringing together a group of bloggers who are writing on this important subject this week. Feel free to pop over to visit her site. Many years ago, while browsing in an indie bookstore in Albuquerque, a book nearly fell on my head. It was Sherman Alexie’s The Lost Ranger and Tonto Fistfight in Heaven. I loved the book as well as the movie made from it, Smoke Signals. Sometime later in Houston, Alexie spoke and held a book signing, and I was one stuttering, tongue-tied lady as I handed him my books for signing. So I was surprised to find The Absolutely True Diary of a Part-Time Indian on the Frequently Challenged Books List, and it seemed like a good one to investigate. A semi-autobiographical account of Alexie’s younger life, the book follows the story of Arnold Spirit, aka Junior, who decides he wants to go to school off the reservation. As he deals with bullying, culture clashes, family alcoholism, and violence, he keeps his sense of humor by drawing cartoons (Ellen Forney provides the illustrations). Why is it a controversial book? Several reasons are listed, including violence, profanity, alcoholism, and slurs about mental disabilities. It’s also considered by some to be anti-family and anti-Christian. However, I suspect one of the big reasons is, Junior masturbates. Oh, dear! Of course, our children would NEVER think of masturbating if it weren’t pointed out to them (*sarcasm*). In spite of the controversy, Alexie has received numerous letters from students who understood the depression and despair in the book, who felt they were helped by Alexie’s words. As someone who came to parenting late (I married into a family with twins who were high school seniors), I haven’t had to face concerns about what my kids are reading. There are definitely some difficult and challenging themes in Diary. To me, though, it’s an opportunity for discussion…not censorship. As we continue to settle in up here in Washington State, I’m getting exposed to a whole new-to-me group of writers. Sure, I knew about Garth Stein, author of The Art of Racing in the Rain, but the Seattle area abounds with innovative, creative individuals. In fact, she and several other area writers have formed an organization, The Seattle 7 Writers (which includes ten writers, but who’s quibbling?). This fine organization provides a number of services designed to encourage reading, including creating pocket libraries and other projects to increase literacy in schools. One of the Seattle 7 is Carol Cassella, who somehow juggles writing, two sets of twins, and, oh yeah, her job as an anesthesiologist. How does she do that? I’m having trouble keeping up with the writing duties. But I digress. Oxygen is Cassella’s first book, which I liked so much that I bought her second, Healer. Keep watch, it may show up here one day in another review! While reading it, I discovered that Cassella grew up in Texas, so we have that whole Kevin-Bacon-Six-Degrees-of-Separation thing going on. Dr. Marie Heaton is a respected anesthesiologist who comes face to face with catastrophe: the death of a child on the operating table. As lawyers swarm about like sharks smelling blood, she must also confront a troubled relationship with her aging father, whose eyesight is deteriorating. The lawsuit drags out and escalates to a breathtaking degree while she struggles to understand what happened that horrible day in the OR. Reading Oxygen, I found myself on unexpected, familiar ground. She led me through my hometown Houston streets, and Dr. Heaton’s experience with her father bore eerie parallels to the decline of my late father-in-law. Also, my own father suffers from macular degeneration, so I know what it feels like to watch a parent going blind. When a novel leads a reader to an unexpected place, a twist that feels natural and logical, that causes the reader to ask, “Why did I not see that coming?”, it’s a gem in my book. Oxygen does that and more. Have you seen The Fantastic Flying Books of Mr. Morris Lessmore yet? What the heck is that, you ask? This magnificent short film stands head and shoulders above its fellow Academy Award nominees for best animated short film. With no dialogue, The Fantastic Flying Books of Mr. Morris Lessmore provides a sweet, touching, and entertaining tribute to books. Click on the link above, and you can watch it for free! If you’ve ever gotten lost in a book, you will love this movie. In an odd timing synchronicity, I saw this film the day after visiting Poe Elementary School here in Houston. Poe is revamping its school library and as contributors, we were invited to come for coffee and to see its progress. We were told tales of moldy books, some of which had racially insensitive content, being removed from the shelves and replaced with a wide selection of everything from Dr. Seuss to The Adventure of Hugo Cabret. Wandering among the books, I couldn’t help but reflect back to my childhood, and how the library became my favorite place in the school. My parents, married as teenagers, didn’t have college degrees, but I remember them both sitting on the sofa in the evenings after dinner, noses buried in books. In our home, piles of books traveled from and back to the library on a routine basis. Some books were read by several household members and discussed, sort of an in-home book club. On Saturday mornings, when doing my cleaning chores, I would have the vacuum cleaner in one hand and a book in the other. The house was never clean, but by God, there were books to read! Even now, though macular degeneration has taken my father’s eyesight, he revels in audio books. How would I have known I was a writer if I hadn’t grown up with such easy access to books? These days, if I want to read something I download it onto my iPad, but my visit to Poe reminded me how special libraries, especially school libraries, are. Budget cuts are making it more and more difficult to keep these libraries stocked. Poe is no exception, and they are continuing their fundraising drive, which is far from over. I think about how different my life would have been without books and the way they showed me a bigger world. School libraries are — or can be — a great equalizer, feeding young minds hungry to learn, and potentially lifting people out of poverty. It troubles me to think that some young people will never know the joy of books reflected in The Fantastic Flying Books of Mr. Morris Lessmore, only because there are few books available to them. If you think this is hyperbolic rhetoric, read this. Or this. Or this. Visiting Poe Elementary, I was reminded how far a small donation can go in an arena such as this. Many people are looking for charities where their donations won’t get lost in the shuffle of a big organization with lots of administrative fees to support the cushy lifestyles of their CEOs. Your local school library is one of those places, where you can see tangible evidence that your contributions have made a difference. If you love books, fantastic flying books or otherwise, won’t you consider sending a few dollars to your local school library? Visit one nearby, and watch your contributions work their magic. Doing so will leave a lump in your throat and a spring in your step. I guarantee it.